It’s not hard to see why glazed stair panels have become so popular. Glass allows the flow of natural light, making rooms seem bigger than they really are, so is ideal for small homes. It used to be restricted to new-builds, but is now frequently used in older properties for an interesting contemporary twist. Our glazed panels are manufactured from toughened safety glass with bevelled edges, and can be made to measure where standard sizes are unsuitable. A balustrade consisting of two or three large sheets of glass is great for creating an impact and will encourage maximum light flow. Smaller panels are also available – these are less showy, but more flexible and frequently the best option for awkward layouts and tight turns. 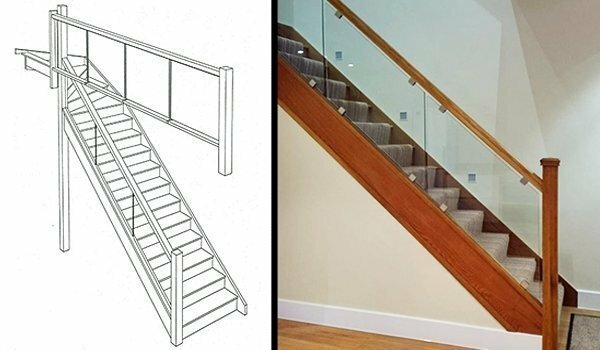 The panels can either be fixed in place with metal brackets (also called clamps) or slotted into pre-cut grooves in the railings, depending on the stair design and personal preference. Have a look through our Case Studies section to see some of our glass staircases. If you have any queries, call our friendly design team on 01938 553311 or email your question via the Contact Us button at the bottom of the page.